From Kalikhola to Panchkilo, the road is extremely dangerous. Signboard notifying the same to drivers and urging them to drive carefully is in place, but some drivers do not care about it. CHITWAN, July 5: Road accidents along the Narayanghat-Mugling road section have so far claimed 47 live this fiscal year. 14 of these victims are still missing. This busy road is a great horror to travelers as they never know what would happen of them on the way. Fear of accident or getting stranded on the way due to landslides looms large. Despite such problems, efforts from the government to address concerns of the travelers seem to be falling short. The road lacks proper arrangement for clearing roads of debris in the event a landslide obstructs the highway. And there is hardly any way to pick passengers immediately if the road gets blocked. According to the traffic police office, Chitwan, landslides are common along the road section during rains. Of the 159 killed in road accidents across the entire district till date this fiscal year, 47 of them died while traveling along this road section. “This road section has killed many people. In monsoon, it becomes deadlier,” said Inspector Santosh Panta, chief of the District Traffic Office, Chitwan. “There are many other road networks here, but this is the most dangerous one,” he added. The total length of the highways that passes through Chitwan is 83 kilometers. Within this, Narayanghat-Mugling section is 36 kilometers long. “This road section is so much dreaded because if a vehicle meets with an accident, chances of it falling into the Trishuli River are maximum,” said Panta adding that finding a vehicle drowned in the river is sometimes even impossible. Project for widening this road section had started over two years ago. Despite alarming reports of accidents and congestion due to the landslide debris, the project has not been able to expedite. According to Panta, this project must be completed as soon as possible to save many lives. “Just recently some police personals were also killed in an accident along the road section. The van in which they were traveling was crushed and buried by a landslide,” he lamented. Dead bodies of the three police personals were recovered two weeks ago from the debris and a victim still remains missing. The news left many numb, however, queues of vehicles, eager to pass through the deadly road, were seen right from the next day. “The Kalikhola landslide killed police personnel and that made many travelers quite nervous. But people have no choice. It was and remains a busy road section,” Panta said. Apart from the landslides from the fragile rocky mountain, too many sharp bends along the road make it prone to accidents. On top of that, only a few drivers drive sensibly and patiently. “No matter how risky the road is, some drivers do not keep the cool. They are always in rush. Some try to overtake others forcefully. Some even don't blow horn at turnings,” he narrated. “Such negligence puts their own and their passengers' life at risk,” he added. Yogendra Hamal, another traffic police inspector in Mugling has noticed nothing different. He says that disciplined drivers should be the first thing that the government should focus on. “I believe that drivers' negligence is the main reason behind most of the accidents. If they drive carefully, accident rate would lessen by over half,” he said. It is not only drivers who are careless, even pedestrians have met with accident due to negligence, Hamal said. “It is just a recent case. Three people walking on the roadside fell into the river. They could have saved themselves had they been more careful,” Hamal stated. With an objective to reduce accidents along the road section, police had identified and marked the most accident prone points and notified concerned bodies. Officials at the road department were informed of these points. Despite that, little attention has been given to their report and recommendations in it. “Nobody takes it seriously until they are directly affected by it,” remarked Hamal. “From Kalikhola to Panchkilo, the road is extremely dangerous. Signboard notifying the same to drivers and urging them to drive carefully is in place, but some drivers do not care about it,” Hamal said. 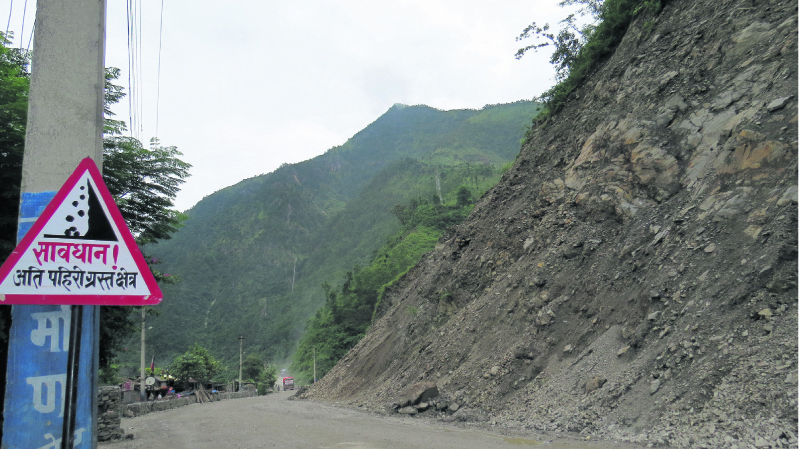 The Narayanghat -Mugling Road Project office informed to Republica that the road section has so far cleared 139 landslides by taking a total of 360 hours. The recent landslide at the Kalikhola had blocked the road for 34 hours. Engineer Shiva Khanal, information officer of the project, opined that time required for clearing a landslide debris could be reduced if the ground team is provided with better equipments and tools. “One hour blockade of the road means at least three hours delay for the travelers,” he said.